SF comedy legend Red Dwarf returns to our TVs, courtesy of a new commission by DAVE. Following on from the much-hyped but pretty terrible Back To Earth, this new 6-part series arrived with a whole heap of expectation. Could it return the series to its heyday? Would it put to rest the lingering distaste of the 2009 special? Would the premise still hold up after all these years? 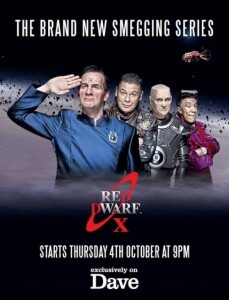 One thing I can say with certainty is that Red Dwarf X, kicks sand in the eyes of the Back To Earth special. Fair dues to DAVE for commissioning the special, and resurrecting a much-loved and all-too-forgotten-about-by-the-BBC comedy series. The problems with the special are myriad and have been hashed over many times before. What RDX needed to do was go back to the magic of the earlier series, forget about clever CGI and film-like pretension and just be a slice of classic sitcom gold, character-based with original scenarios and quotable one-liners. And has it achieved this? Oh yes, by the Starbug-load. Gone are the shiny spacesuits and gaudy costumes. Vanquished are the CGI-heavy pseudo-sets. This is Red Dwarf as it was back in seasons 1-3. Small scuzzy sets that looked lived in and believable. A Red Dwarf that appears old and decrepit, functional but only just. Silver is banished and red & grey predominate. The crew quarters, while a new design, feel like a subtle upgrade of the original series 1 quarters. The drive-room, again new, is not so far removed from the original drive-room (albeit with a nice spiral staircase for added class). The corridors are low-rent, the dispensers are talkative and characterful, and best of all we stay (for the most part) on the ship. The later-BBC series lost much of their charm when the crew travelled extensively off-ship (or off-Starbug). It is reassuring and comforting to be back on board the Red Dwarf after all these years. Little has changed with our four heroes. They all look a little more aged, but otherwise they are the same Lister, Rimmer, Cat and Kryten we’ve come to love. Rimmer has reverted to a more ‘early-series’ whineyness, and the Cat seems to have lost a little of his ‘later-series’ intelligence. Dave still loves curry and booze and is searching for his lost love Kochanski. Kryten looks a little different (a side effect of Robert Llewellyn getting older and, dare we say it, a little larger), and also appears to have regressed to his more overly-agitated cleaner-bot persona. But these minor things aside, the boys are back and arguing and squabbling just as they always have. The chemistry is definitely still there, and the four actors genuinely look like they are having a great time working together again. Sadly though, there is someone missing. Holly, the loveable RD computer. I was always a Norman Lovett fan, not so much a Hattie Hayridge one…but Holly was integral to the Red Dwarf experience, and so far in RDX my only real complaint is that the character is missing. Holly’s stupidity, dry laconic sense of humour, ability to cause mayhem, and surprising deus ex machina saves were a vital component of why early RD worked so well. I don’t know why the writers haven’t brought Holly back, but I am hoping they do at some point soon. So, with a characterful crew, old-school spaceship and even a live-audience back in place, does RDX work? Is it a success? Four episodes in and all memories of Back To Earth and series 7 & 8 from the BBC are washed away. This is Red Dwarf as it should be, as it once was. Layered character interaction within cleverly constructed scenarios with lashings of one-liners and great visual gags. Buffoonery, slapstick, surrealism and kitchen-sink, all mixed up with a healthy dollop of silly. 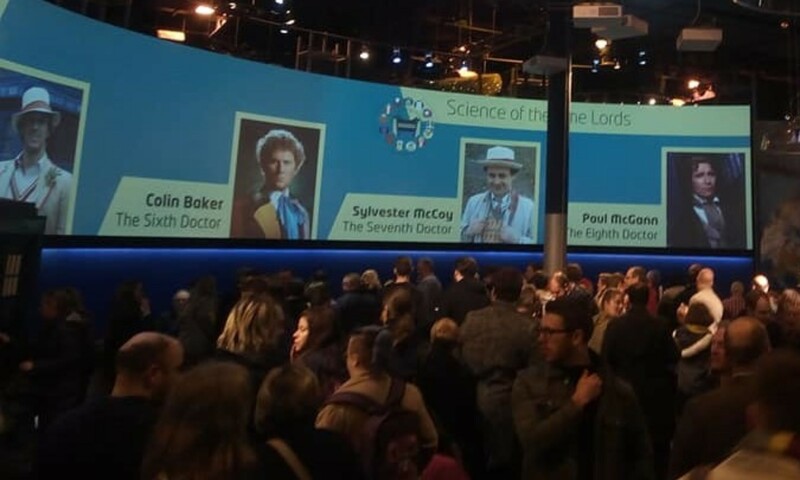 The writers have clearly made an effort to recreate the atmosphere and simplicity of the early series, while not reverting the characters to their primitive forebears. We still have hi-tech gadgetry and a cleaning-droid who mysteriously has the capabilities and knowledge of a much higher-level machine (just how does Kryten know so much about Earth technology & history since he was marooned for 3 million years in a crashed spaceship? ), yet we also see him panicking over cleanliness and drying spoons with his ‘rear heat exhaust port’. Dave Lister, forever the space-bum, is less motivated than we have seen him of late, but much more human for it. Still a slob, still chasing a romantic impossible dream, yet he is also still looking to better himself (even though it is only to annoy Rimmer). The Cat is still very much The Cat. Danny John-Jules continues to amaze and amuse with his unique creation…part fashion diva, part Prince, all fabulous. Over recent series his character had evolved into a more human role, mastering spaceship control, use of advanced gadgetry and generally being far less stupid and much more helpful. Whilst this serviced the plots, it took away some of his charm, made him too much like Lister, and denied us the chance to enjoy his naivety and credulousness. In RDX he seems to have reverted to his more foolish, vainglorious past. He is clearly less intelligent but more fashion-tastic than in recent series, and as such he is more charming, fun and watchable. Rimmer, meanwhile remains whiney, vain, arrogant, obnoxious, aloof, selfish and yet amazingly loveable. While he has remained a ‘hard-light’ hologram via the light-bee device, gone is the hard-edged hateful character of the recent past. He seems more vulnerable, more human…and yet his pettiness and officiousness have increased, back almost to series 1 levels. He is a small man who uses his rank to bully, when what he really yearns for is respect and friendship. This is the Rimmer we know of old, no more complex than he needs to be, and with no references to his complicated recent history. He is petty, insecure and loathsome, but he’s just what Lister needs to stay sane. Rimmer receives an SOS distress from a doomed ship commanded by his all-conquering brother, Howard. But Rimmer can’t bring himself to save Howard until he’s on an equal footing career-wise. He has 15 hours to pass his Astro-Nav exam and become an Officer. The same exam he’s already failed 9 times. A good start to the series, with Rimmer on classic ‘selfish’ form, and a nice link back to much earlier revelations about his brothers and his relationship with them and their success. Every year Lister sends himself a Father’s day card to celebrate the fact that he is his own father but when Rimmer points out he’s been a lousy father to himself Lister decides to do something about it. Meantime Rimmer and Kryten install a new computer, the beautiful, but lethally logical, Pree. Episode two takes us into deep, dark RD history, building yet further on the fact that Lister is his own father. Some lovely acting by Craig Charles as the two Listers, and a genuinely clever play on the old ‘video message from yourself’ trope. Marooned in Britain in 23 AD, the Dwarfers need an 8 volt battery to power up their Returner Remote and get home. Remembering a lesson from school, Rimmer suggests they make a battery out of lemons but the nearest lemon in Britain 23 AD is is in India 4,000 miles away. They begin their journey, a journey that will ultimately lead them to a meeting with a historical A-list celebrity that could alter the entire history of civilization. For episode 3 we move away from Red Dwarf and do a ‘historical’ ep…something RD is well-known for. Some lovely visual gags here, plus a brave (in our current religion-must-not-be-mocked age) use of Jesus as a comedy character. Harks back to a certain JFK episode, but is none-the-worse for doing so. Lister loses Rimmer in a game of poker to a group of Biologically Engineered Garbage Gobblers, and in return gets an unwanted gift: a groinal exploder programmed to detonate in 24 hours unless Lister pays his debts. Meanwhile, Kryten and Cat become quantum entangled and do everything in perfect unison. Ep 4 is a mixed beast, with the ‘entanglement’ sub-plot feeling rather sparse and almost (but not quite) superfluous. Lister gambling away Starbug and Rimmer is classic RD and is a superb storyline. There are a couple of gripes though…how does Rimmer’s light-bee pass through the locked door…and just how did Kryten & The Cat’s entanglement cause the Beggs to choke to death? That aside, there is some terrific dialogue in this episode…great fun. Just two more episodes to go and so far I am loving RDX. It is fun, witty and unafraid of embracing what made series 1-6 so brilliant…silliness. Doug Naylor has recaptured the magic of those early series, and yet managed to unencumber RDX of the weight of history and storylines-past. This is RD stripped to its core…the last human alive, 3 million years into outer-space, on a tired old mining ship, with just a hologram, evolved cat and cleaning droid to keep him sane and alive. The gags are good, the visuals are fantastic (it was lovely to see a matte-painting used in ep 4, rather than a CGI landscape) and the actors are all on top-form. Yes, there is nostalgia at work here for me, and any older RD fans, but I can see new fans being brought in to the fold through this superb series. All credit goes to DAVE for commissioning and funding the show, and I am sure I am not the only person hoping that it has proved to be a roaring success for the channel and that they go on to commission many more series.